Sunoco is an American petroleum and petrochemical manufacturer headquartered in Newtown Square, Pennsylvania, United States, formerly known as Sun Company Inc. (1886–1920 and 1976–1998) and Sun Oil Co. (1920–1976). Sunoco is one of the largest gasoline distribution companies in the United States, with Sunoco brand gasoline being sold in over 4,700 outlets spanning 26 states, just over a third hosting convenience stores. Since 2012, Sunoco has been a wholly owned subsidiary of Energy Transfer Partners, based in Dallas, Texas. Sunoco is a Fortune 100 Company. In 2011 it was ranked as the third largest company by revenue in Pennsylvania, after AmerisourceBergen and Comcast. In 2011, the company decided to exit the oil refinery business. The integrated oil company now known as Sunoco began as The Peoples Natural Gas Company in Pittsburgh, Pennsylvania. In 1886, its partners – Joseph Newton Pew, Philip Pisano and Edward O. Emerson – decided to expand their gas business with a stake in the new oil discoveries in Ohio and Pennsylvania. Four years later, the growing enterprise became the Sun Oil Company of Ohio. Sun Oil diversified quickly, active in production and distribution of oil as well as processing and marketing refined products. By 1901, the company was incorporated in New Jersey as Sun Company and turned its interest to the new Spindletop field in Texas. Pew's sons, J. Howard Pew and Joseph N. Pew, Jr. would take over the company after their father's death. With a growing portfolio of oil fields and refineries in hand, Sun opened its first service station in Ardmore, Pennsylvania in 1920. The name changed back to Sun Oil Company in 1922 and, in 1925, Sun became a publicly traded company on the New York Stock Exchange. Sunoco ranked 39th among United States corporations in the value of World War II production contracts. Sun expanded internationally following the war. Its first Canadian refinery was built in 1953 in Sarnia, Ontario, home to a burgeoning new petrochemical industry. Sun established a facility at Venezuela's Lake Maracaibo in 1957, which produced over a billion barrels (160,000,000 m3) before the operation was nationalized in 1975. Sunoco is perhaps best known to consumers for its "custom blending" pumps, an innovation that, beginning in 1956, allowed customers of Sunoco service stations to choose from several octane grades through a single pump. Sunoco stations offered as many as eight grades of "Custom Blended" gasolines from its "Dial A Grade" pumps ranging from subregular Sunoco 190 to Sunoco 260, the latter a super-premium grade of 102 octane that was advertised as the "highest octane pump gas" and very popular with V8-powered Muscle Cars of the 1960s. In 1968, Sun Oil merged with Tulsa, Oklahoma-based Sunray DX Oil Company, which refined and marketed gasoline under the DX brand in several midwestern states, and included several refineries including one in Tulsa that was operated by Sun until its sale in June 2009 to Holly Corporation of Dallas. This move expanded Sun's marketing area into the mid-continent region. 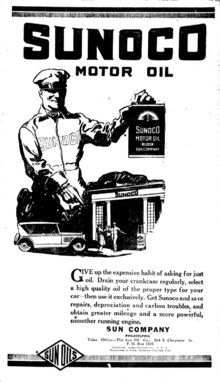 Sun Oil continued marketing its petroleum products under both the Sunoco and DX brands through the 1970s and into the 1980s. In the late 1980s, Sun began rebranding DX stations in the Midwest to the Sunoco brand and even introduced the high-octane Sunoco ULTRA 94 gasoline to stations in that region, but by the early 1990s, they pulled out of virtually all areas in the southeastern U.S. and west of the Mississippi, resulting in the closing and rebranding of service stations and jobbers to other brands in those areas, notably Sinclair in Oklahoma. By the 1990s, Sun had departed the international exploration business and was fully dedicated to its branded products and services. In 1994 Sunoco acquired the Philadelphia Chevron Oil refinery consolidating operations with its own adjacent which it had acquired with Atlantic. Sun sold its remaining interest in Canada's Suncor Energy in 1995, but markets product from two refineries – one in Toledo, Ohio, and the other Sarnia, Ontario – in joint ventures. In 1998, Sun Company, Inc. became Sunoco, Inc. In 2011 the Toledo facility was sold to PBF Energy. By 1998, Sun had acquired Allied Signal, Inc. chemical plants. Allied Signal, Inc. being on the stock exchange sold half of the company to Honeywell, Inc. and the other half to Sunoco, Inc. The chemical portion of the business was called "Sunoco Chemicals, Inc."
In 2003, the Speedway SuperAmerica chain of gas stations and convenience stores exited the Southeastern United States and sold most of their operations to Sunoco. Shortly prior to this, Sunoco acquired many service stations from Coastal Petroleum, especially its stations in Florida. This has led to the reintroduction of the Sunoco brand to areas it pulled out of ten years earlier. Coincidentally, Speedway would later re-enter the Southeast with its purchase of Hess Corporation's downstream operations in 2014, mirroring that of Sunoco's return to the Southeast. In 2004, Sunoco replaced ConocoPhillips' 76 brand as the official fuel of NASCAR. After ConocoPhillips abandoned the marketing of the Mobil brand name in the Washington, DC, area, Sunoco purchased these rights, and has since been converting Maryland and Virginia Mobil stations to the Sunoco brand, bringing the A-Plus convenience store with them – prior to this, these stations had convenience stores under the Circle K or On the Run brands. In September 2009, Sunoco announced the sale of its retail heating oil and propane distribution business to Superior Plus Corp for $82.5 million in cash. In October 2009, Sunoco announced it will idle and possibly permanently shut down its Eagle Point/Westville, NJ plant, laying off over 400 employees. In December 2010, Sunoco sold its refinery in Toledo, Ohio to PBF Energy for US$400,000,000. Effective 6 September 2011, Sunoco announced that it would exit the crude oil refining business and seek to sell its Philadelphia and Marcus Hook refineries by mid-2012. The company has said that its cost for exiting the refining business could be as high as US$2.7 billion. According to one report, the company had lost some US$800,000,000 on refining operations since 2009; an earlier report provided a figure of US$772,000,000. On December 1, 2011, Sunoco announced it would accelerate closure of the Marcus Hook facility, with a target completion in 90 days. The Marcus Hook facility, founded in 1902 and covering 781 acres, was dedicated exclusively to the processing of light sweet crude oil; this processing focus combined with volatility in crude oil prices are considered contributing factors to both this refinery's closure and Sunoco's exit from the refinery business. After weeks of negotiations, it was announced that Sunoco would be forming a joint venture with the Carlyle Group, allowing for the continuation of operations at the Philadelphia refinery, and saving over 800 jobs. The joint venture began in late 2012. In 2012, Dallas-based energy company Energy Transfer Partners purchased Sunoco, making Sunoco a wholly owned subsidiary. As Energy Transfer Partners was more interested in Sunoco's pipeline and refining business that the company was originally planning on exiting, it led to speculation that Energy Transfer Partners would eventually spin-off Sunoco's retail business or sell it outright to a competitor. In 2014, Energy Transfer Partners announced its purchase of Susser Holdings Corporation, the parent company of Stripes Convenience Stores, and plans on merging it into Sunoco. Upon completion of the merger, Sunoco will be placed into a limited partnership called Susser Petroleum Partners L.P., in which Energy Transfer will have an ownership stake. The deal saw the arrival of the Sunoco brand in Texas, where it replaced Valero at the Stripes locations; Stripes and A-Plus remain separate brands. Also in 2014, Sunoco acquired Aloha Petroleum. In 2015, Sunoco entered into an agreement to purchase MD America operations in east Texas. That same year, Sunoco became a Subway franchisee by opening Subway at the North Midway Service Plaza on the Pennsylvania Turnpike near Bedford, Pennsylvania. Ultra93 (formerly Ultra94; Sunoco began phasing out the 94 octane gasoline in the first decade of the 21st century). Sunoco also once sold Economy unleaded, an 86 octane slightly cheaper than regular, in all of its markets until the mid-1990s when it was withdrawn from Pennsylvania and a handful of other states, and was phased out altogether in 2003. In addition to their sponsorship deal with NASCAR, Sunoco also has exclusive deals as the gasoline supplier at the travel plazas along the Pennsylvania Turnpike, New Jersey Turnpike, Atlantic City Expressway, Palisades Parkway, and Delaware Turnpike. In 2011, Sunoco acquired the rights to operate the nine plazas on the Garden State Parkway, and also signed a new contract to operate the 16 plazas on the Ohio Turnpike beginning in 2012. Also, the two newly renovated service areas on Interstate 95 in Maryland - Chesapeake House and Maryland House - also offer Sunoco as their gas offerings. Sunoco also operates some of the filling stations on the New York Thruway. In addition, Sunoco also owns & operates a station with an A-Plus convenience store at Pittsburgh International Airport, as Sunoco has a very large market share in Pittsburgh. Due to its large presence in Western Pennsylvania, Sunoco is a longtime sponsor of the Pittsburgh Pirates, with an advertisement for Sunoco being present in left field at PNC Park. Sunoco became the official current fuel supplier of the IZOD IndyCar Series (now the Verizon IndyCar Series) in mid-2010. Sunoco was the only oil company to initially sign the Coalition for Environmentally Responsible Economies (Ceres) principal. However, as of March, 2016, Sunoco is not listed as a Ceres Coalition or Company Network member of Ceres. In 2000, Sunoco leaked 190,000 gallons of oil into the John Heinz Wildlife Refuge in Pennsylvania through a cracked pipe. Sunoco's safety systems did not detect the leak, which was reported by a hiker in the Wildlife Refuge. Pennsylvania Senator John Heinz, for whom the John Heinz National Wildlife Refuge is named, was killed on April 4, 1991, when a Sun Company helicopter collided with an airplane carrying the Senator. (Sun Company is the predecessor of Sunoco). That accident also killed two children at the Merion Elementary School playground, into which debris from the two aircraft fell after the collision. The National Transportation Safety Board determined that the probable cause of the accident included poor judgment on the part of the captain of the Sun Company helicopter, and his failure to maintain safe separation from the Senator’s airplane. As of March, 2016, records maintained by the United States Pipeline and Hazardous Materials Safety Administration (PHMSA) show that Sunoco has experienced 257 hazardous liquids incidents since 2006. (PHMSA defines an "incident" as an event that involves a release of gas from a pipeline or of liquefied natural gas or gas from an LNG facility that results in a death, or injury necessitating hospitalization; or property damage of $50,000 or more). These 257 incidents resulted in $46,936,215 of property damage. In terms of number of incidents, Sunoco has the worst safety record of 1,518 active pipeline operators who report operating data to PHMSA. In 2014, Sunoco, along with other defendants, was sued by the Commonwealth of Pennsylvania, which alleged that Sunoco and the other defendants polluted the waters of the Commonwealth with MTBE, a gasoline additive. The Commonwealth also alleged that the defendants, including Sunoco, improperly accepted state funding to clean up spills which occurred prior to 1994, and which were therefore not covered by the fund. In 1989, NASCAR team owner Billy Hagan acquired sponsorship from Sunoco for four seasons. Sterling Marlin drove the #94 Sunoco Ultra94 Oldsmobile during the 1989-90 seasons and Terry Labonte for the 91-92 seasons. In 2015, Sunoco became the Official Fuel of the NHRA. In 2016, as part of the Daytona update coinciding with the 2016 Daytona 500, a NASCAR version of the Toyota Camry with Sunoco as its main sponsor appears in Real Racing 3. 1 2 "2009 Annual Report". Sunoco. Retrieved 2010-12-09. ↑ Retail Marketing - Overview Archived March 1, 2012, at the Wayback Machine..
↑ Cable News Network. Fortune 500 2011: States: Pennsylvania Companies Archived October 31, 2013, at the Wayback Machine.. CNN Money. Retrieved on: 2011-02=12. ↑ "Sunoco Chemicals and the Sarnia Refinery". Sunocochem.com. Retrieved 2011-11-25. ↑ "Speedway to Acquire Hess Retail". Marathon Petroleum Corporation. Retrieved 24 May 2014. ↑ Sunoco to sell retail heating oil business, Reuters, September 02, 2009. ↑ The Carlyle Group and Sunoco Agree to Form Philadelphia Refinery Joint Venture. Archived September 20, 2016, at the Wayback Machine. 1 2 3 Maykuth, Andrew. "Sunoco parent buys Texas chain for $1.8 billion". Philly.com. Retrieved 2 May 2014. ↑ "Aloha Saying Goodbye to Hawaii". CSP Daily News. Retrieved 2016-05-15. ↑ Sunoco Drives Onto N.J.'s Garden State Parkway Archived March 14, 2012, at the Wayback Machine. ↑ Sunoco to Fuel Ohio Turnpike Archived March 14, 2012, at the Wayback Machine. ↑ Business Wire (2010-05-27). "Sunoco to Become Official Fuel of Indy Racing League in 2011". Business Wire. Retrieved 2011-11-25. ↑ "Archived copy". Archived from the original on 2016-05-08. Retrieved 2013-07-25. ↑ "Archived copy" (PDF). Archived (PDF) from the original on 2016-03-16. Retrieved 2016-03-06.